Linda Clark, an experienced and successful AKC registered handler has been showing dogs of all breeds since 1979. 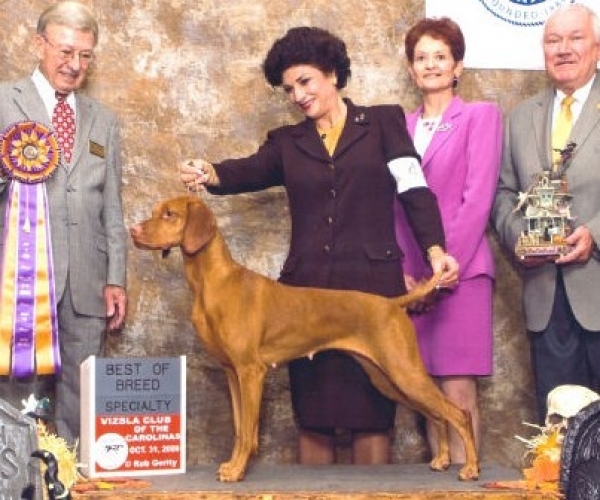 Linda has campaigned numerous best in show and best in specialty show dogs, bringing several to number one in their breed. When she is not traveling across the US, Canada and internationally for shows, Linda can be found at Woodland West Pet Care the business she co-founded with her husband, Dr. Ross Clark. Woodland West sits on a 66 acre property in Tulsa, OK and includes an animal hospital and state of the art training and boarding facility. I had the pleasure of meeting Linda at the 2011 Westminster Kennel Club Dog Show in New York. You've been handling dogs for over 30 years now. What has been your inspiration to work with dogs? I've always had a love for animals. Actually horses were my first love, but I've always been around dogs as well. My family had a sheltie and growing up I remember watching movies like Old Yeller and Benji and just knowing that I wanted to work with dogs. After high school I volunteered at Animal Aid of Tulsa, which involved rescuing trapped and injured animals. I remember many nights leaving the house at 2 or 3am after the police had gotten a report of an injured dog or cat. I've been working with animals ever since. How did you get started in the dog showing business? I got started training dogs to become therapy dogs. These were dogs that we'd bring to nursing homes and hospitals to help cheer up the patients and keep them from getting depressed. I guess as far as showing and handling, I got started with a rescued sheltie that I adopted over 30 years ago. Once I got my first taste of working with show dogs, it just became something I wanted to keep doing. So I understand that you mentor juniors to become show handlers. Can you tell me a little about that? Each summer, I have a few juniors who stay at my Woodland West Resort and who travel with me to handle dogs in the shows. I will have some children as young as 10, but mostly between 14-17 who have a true passion. I require that each junior maintains good grades in school and has their parents' consent. I have learned that the children can really work hard and they want to earn success from their efforts. I feel like this is an opportunity for me to teach the next generation about how to train and care for dogs. Do you have any advice for pet owners on how to best train their dogs? If you spend the first several months training your dog properly, you will build a strong bond that will reward you for years. Dogs really want to please their owners, but the dog needs to know what's expected of them. I highly recommend that owners bring their new dog to puppy kindergarten and teach the dog to curb unwanted behaviors like biting and excessive barking. I also would ask everyone to get their pet (whether dog or cat) micro-chipped or tattooed to help identify them if they get lost. It makes finding their owner so much easier.